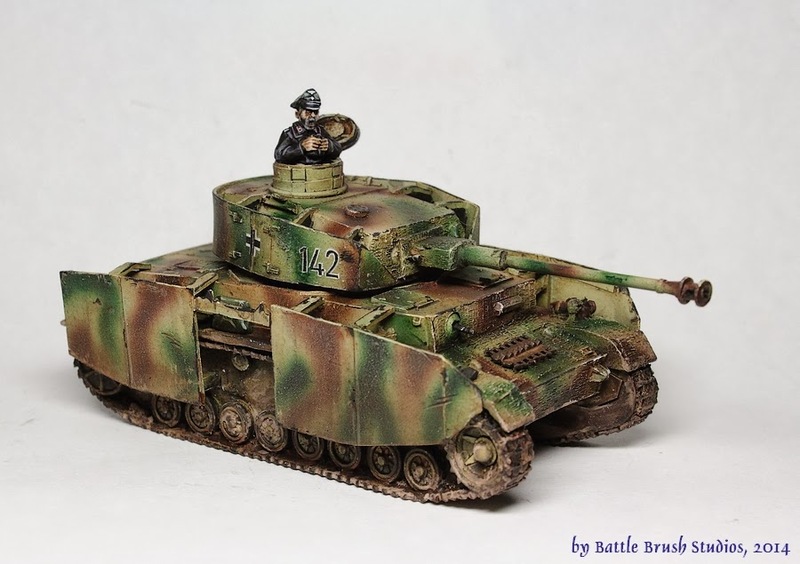 When I started the WW2 themed month, which now has become one-and-a-half months because there wasn't enough time to fit in all the content I had prepared and I want to give people time to take advantage of the -20% off on WW2 painting/modelling commissions, I asked around what people would like to see me review. One of the first answers was "TANK! Don't care what but TANK!" (quoting from memory here ;-) ). So after this subject has been covered in 15mm, I also got myself a 28mm test subject to have a look. 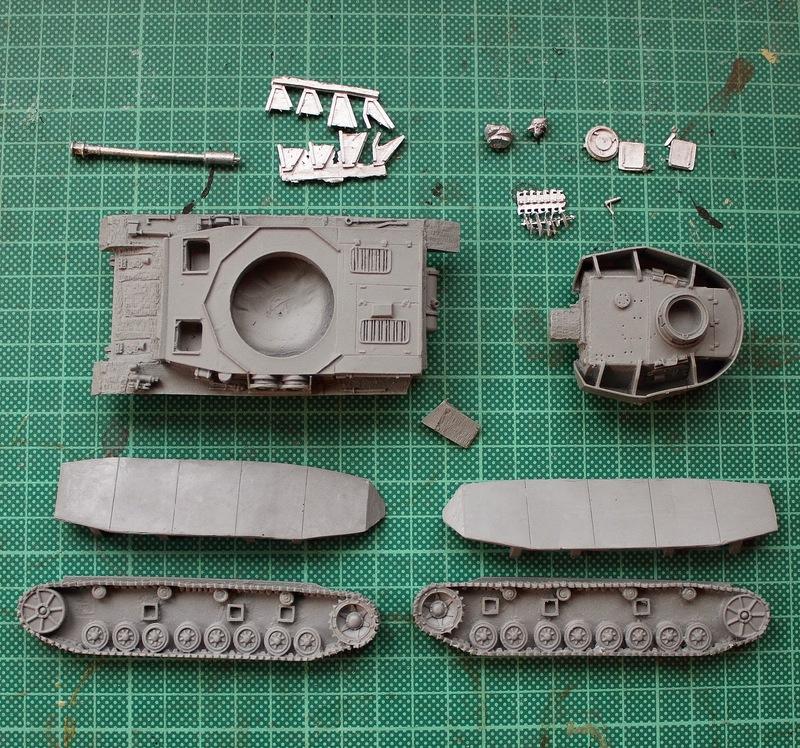 It's Warlord Games' Panzer IV Ausf.H. 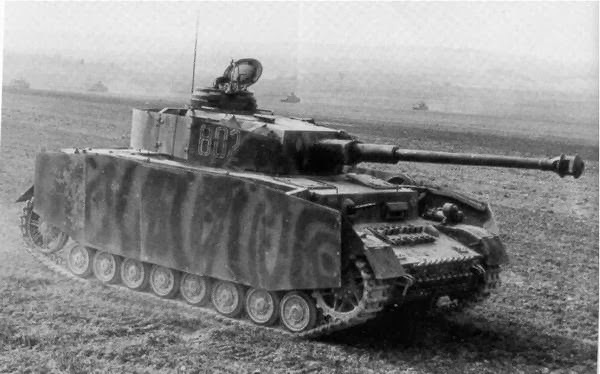 Between the huge number of tank models and their variants the Wehrmacht employed during the war, the Panzer IV probably is the closest they ever got to their main battle tank. It started out as a support tank for the Panzer III. In this role it was mainly meant to combat anti tank guns and infantry formations with its short 7,5cm gun and HE rounds. 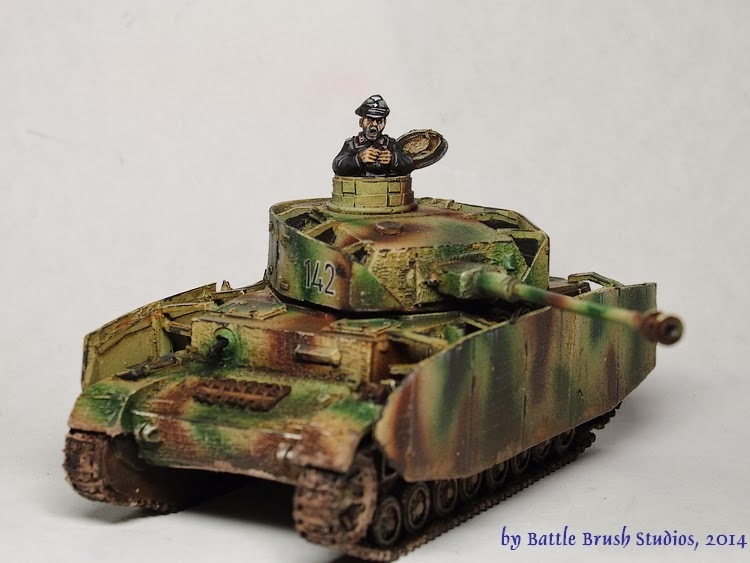 It was only later in the war and after the Panzer III's 5cm KwK (tank gun) proved to be insufficient to crack the armour of new types of enemy tanks that with it's Aufs.F2 Panzer IV's gun was upgraded to a long 7,5cm KwK to combat the new Russian tank models KV-1 and T-34 more effectively. 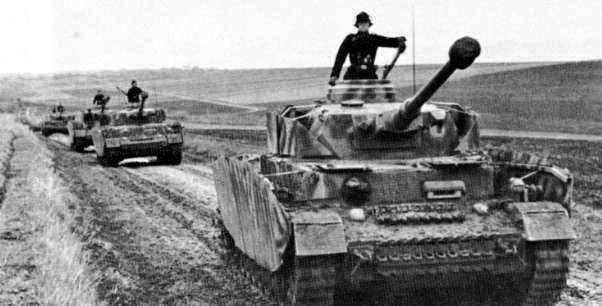 This way Panzer IV became the Wehrmacht's medium main battle tank. 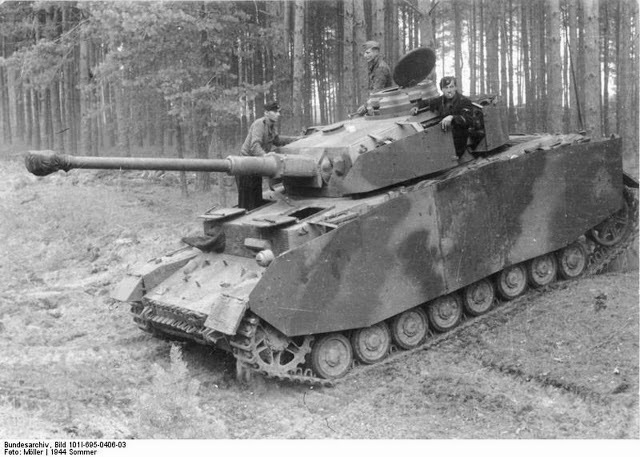 Ausführung (Mark) H was the most numerously version of this tank produced. Along with increased armour the whole of Ausf.H was equipped with Schürzen (5mm thick sheets of metal on the sides and around the turret as spaced armour). Schürzen had become a necessity after the emergence of shaped charges, bazooka rounds and such. Due to the constant upgrades throughout the war Panzer IV proved to be a valuable 'work horse' of the German army, despite the basic design stamming from the 1930s, increasing shortage of raw materials and a huge numerical disadvantage. Panzer IV was equal to or even surpassed its peers even in 1943. So much for the history, let's have a look at the model. It's been a while sind I've had a Panzer IV in hands (again memories of my scale model years emerge). The box is nicely bite-sized so to speak. It has a painted example of the model on the front and spells out what's in the box. 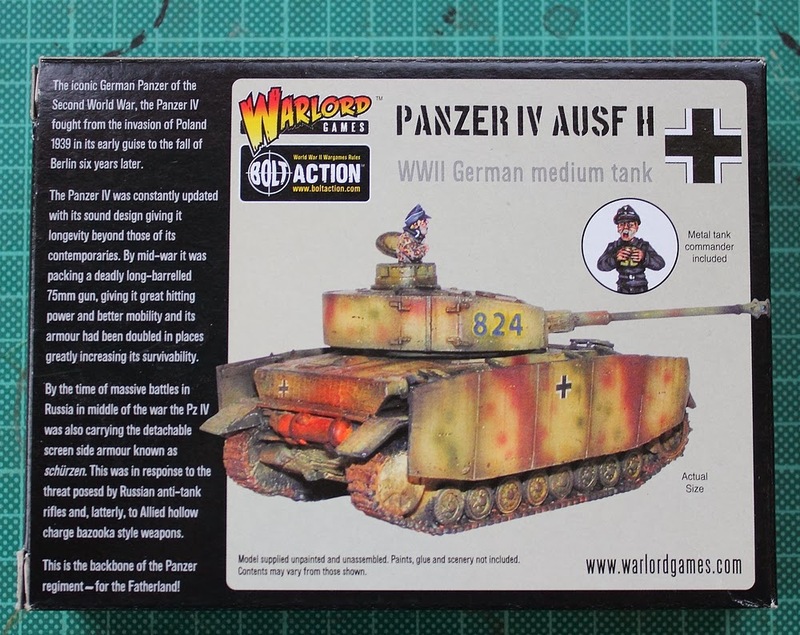 The back of the box has another shot of the vehicle painted and some info on Panzer IV. 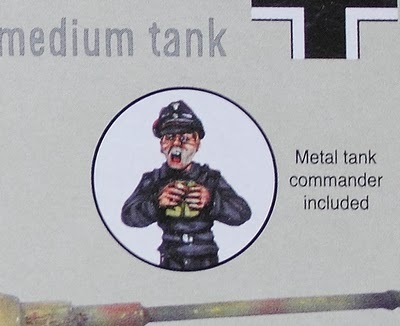 In the front and back it says that a metal tank commander is included which of course is good. 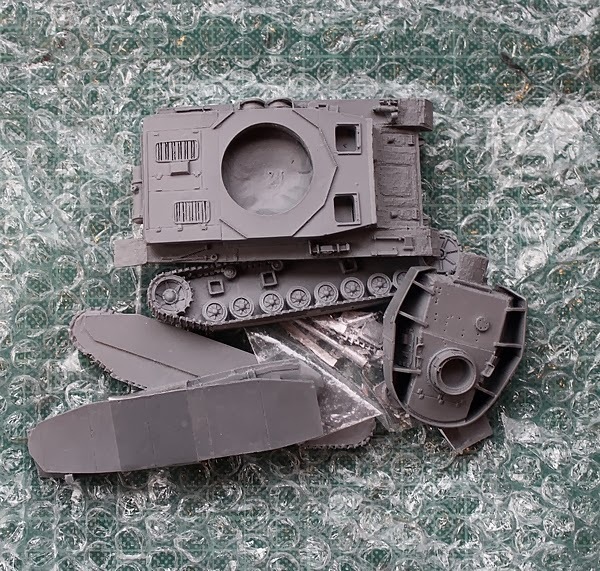 However, Warlord Games' website doesn't mention that and only shows pictures of the tank with the commander's hatch open and no commander. 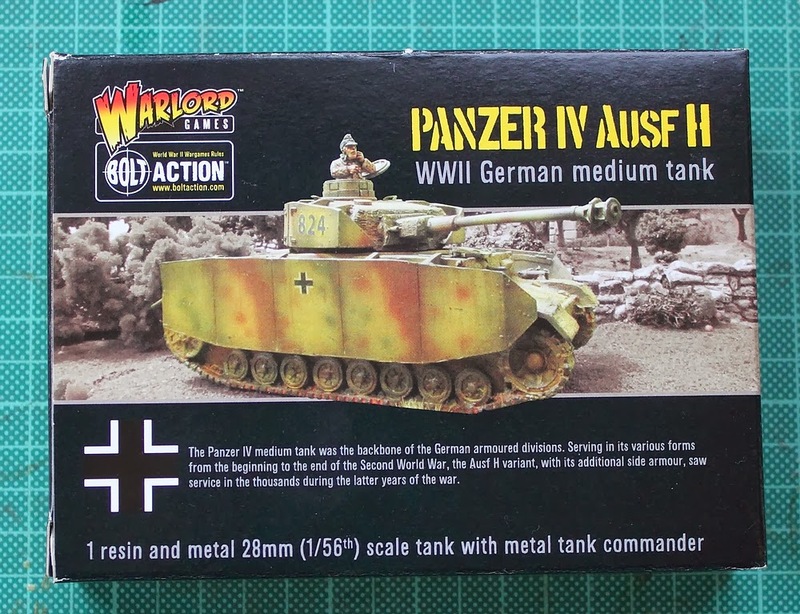 The product info lists the tank and "metal pieces for detailing", but nothing about a commander figure so I thought that there weren't any included and ordered the late war tank crew as well. Granted, I could have googled reviews of the kit and probably would have found out but with all models I get for review purposes mainly I don't read any reviews so I can be more objective in forming my opinion. Well, that would have been handy to know. So I've got three surplus tankers now, one of which having been included in the box. Oh well. The single pieces come a little crudely wrapped in bubblewrap. There are no building instructions included, nor is there a decal sheet which I found very odd. The turret and chassis (wheels and tracks aside) are one-piece casts each, putting it together leaves the turret a little space to "wobble around". No big deal but if you don't like that I suggest using a pin to mount the turret on. The side Schürzen and the whole running gear and tracks are resin pieces as well. Both the track parts and Schürzen were rather bent. With the Schürzen being cast in one piece it was to be expected that they would be bent. With the tracks it was a bit more surprising and took some more work to get them somewhat straight. The tank chassis was damaged in two places but no biggie and easily fixed. 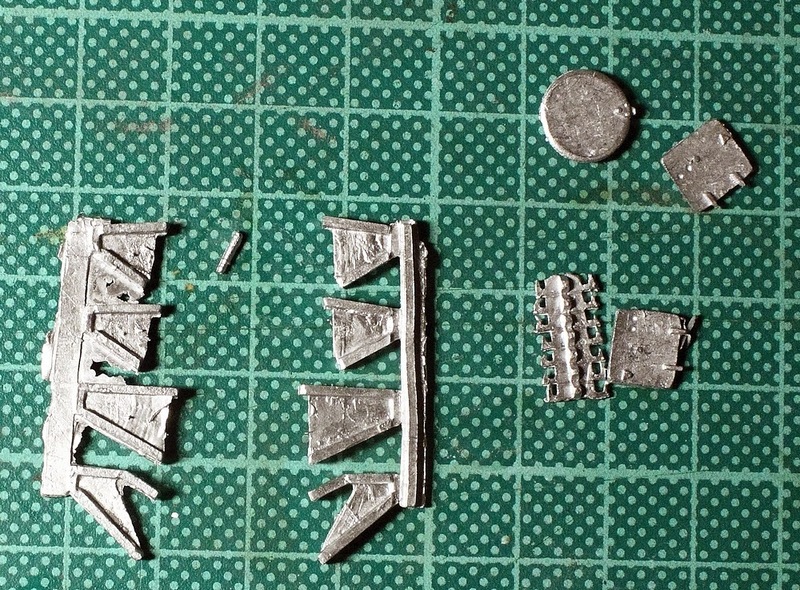 The metal parts include bits to mount the side Schürzen, a piece of extra tracks, the gun barrel, hull MG barrel, hatches and the commander figure. The casting quality looks alright, the Zimmerit detailling is pretty good. The wheels and suspension aren't amazingly detailled but the Schürzen would cover up most of that anyway. When buying the model I had hoped that the model gave you a choice between having the Schürzen or leaving them off. Well, they're cast onto the turret so no way to get rid of those. The side Schürzen you could leave off if you want but you would have to cut off the big mounting holes in the lower chassis. The muzzle brake is a little underdetailled I think. On one side the holes were not visible at all and on the other side they weren't very appearant either so I had to drill and cut them out. Same with the muzzle. The side Schürzen metal mounting parts come with metal where it doesn't belong so I cut that out, only leaving the two "thin" parts rather than full a triangular shape. It's additional work but I think it pays off, otherwise the look on too much detail is obstructed and it would be weird to paint things what shouldn't be there. Another thing I noticed about mounting the Schürzen is that the holes made for the lower Schürzen supports don't quite work. I had to remove those and fit the Schürzen a bit to the back. What I also noticed is that the cupola looks very weird. I don't think it's historically correct. 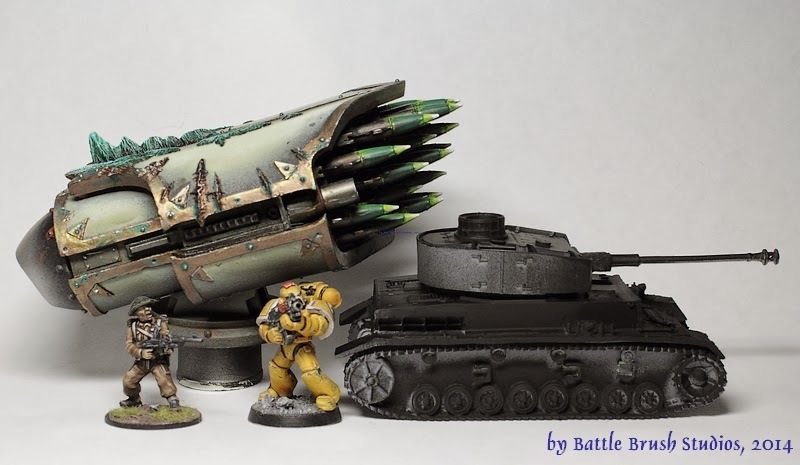 Here you can see the built and half-primed model in a size comparison shot with a Commando, a Space Marine and a Reaver titan's missile launcher. After a good wash and attempting to bend the rather massive resin pieces into shape assembly itself it a breeze. You may want to pin the gun barrel though. On one side I removed one of the Schürzen plates for variety. If you do that, be careful to cut out the mounting which thankfully is cast onto the back of the Schürzen. I also added a jerry can and a steel helmet for detail. I definately advise to keep the Schürzen off until everything is painted. Painting the model was fun but took me quite a qhile, experimenting with new and old ways of weathering and all of that. Much fun. 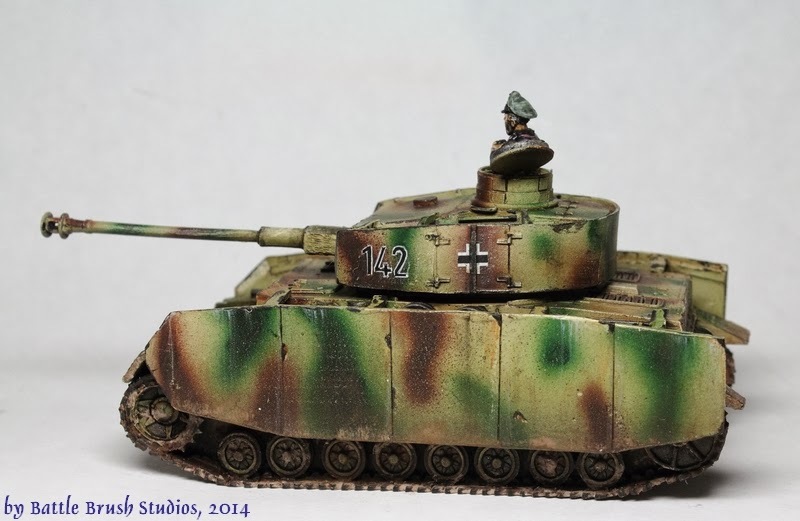 The decals used on this model I nicked from the Warlord Games plastic SdKfz251 kit. The odd thing about this sheet is that the numbers come in plain black which to my knowledge was rather uncommon. So I painted the white outlines by hand. The size of the model seems to be alright for 1/56th scale. The price of £22.00 is along the lines of other manufacturers, possibly a little lower in comparison to some other manufacturers. I like the look of the model overall. It is a wargaming model rather than a 'proper' scale model so you will have to keep that in mind when it comes to details. The Schürzen are a bit too thick, the little arms on which the Schürzen are placed upon very much so. For a bit I considered looking for photoetched metal parts to replace the Schürzen but that wouldn't have worked along with the review and now that the model is finished I'm alright with the look. The website could have been clearer on the commander. Not including any decals along with the model I still think is highly odd. It's weird, I'm perfectly okay with that when it comes to smaller manufacturers (whom I hold so dear) but with Warlord Games, who clearly aim to be the one-stop-store for all your historical wargaming needs in 28mm (kinda what Battlefront and GW do in their fields), I would have expected decals to be included. 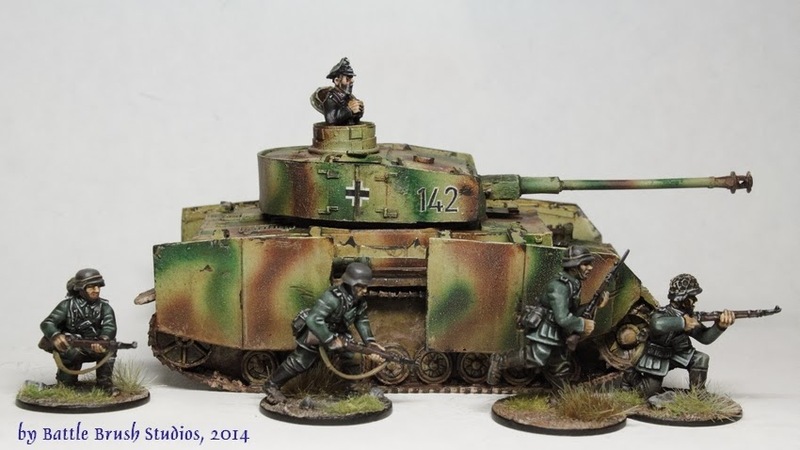 When it comes to 28mm WW2 gaming especially, many people these days seem to like using 1/48th models. Partly I can understand that, especially if the use the bigger, bulkier infantry models from Warlord Games for example and especially so if they use the high, GW-style bases as well. And I do see the slight problem of scale. The tankers for example are a little smaller than the infantry. I think that they even modelled the commander's cupola in the weird way that they did to fit a larger model on there. To my knowledge, the Panzer IV H's commander cupola did NOT look like it does on the model. It's not too appearant on the table and realistically, tankers would tend to be on the smaller side but I can see it being a problem to some people. However, I like to stick with the "correct" scale. Vehicles in WW2 often just were smaller than we like to think with our possibly 40k-influenced minds. So This is why I go 1/56th scale. So overall there are a few things to nitpick about this model. However, the price is rather good and Warlord Games are just very convenient to use for their broad range of models. 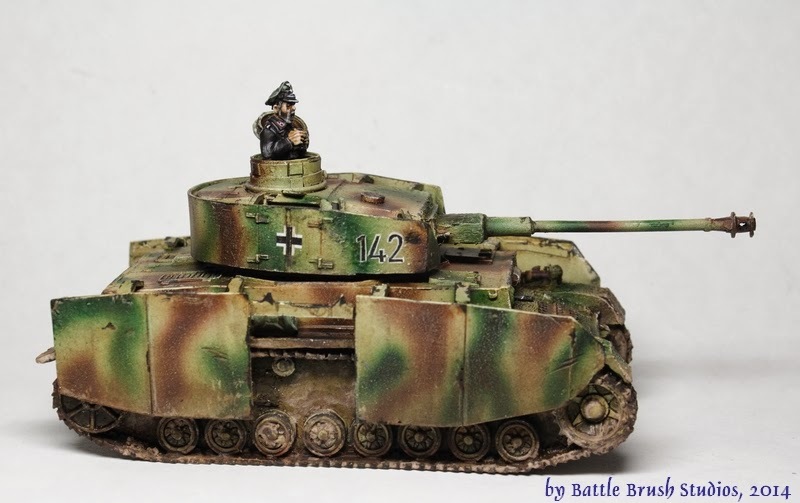 In wargaming terms this is a good model and if you're looking for a 28mm scale Panzer IV you can go with this one. I rather like it. I hope that you enjoyed this review, found it interesting, entertaining and so on. Something positive I hope. ;-) If you have any questions, comments or indeed commission enquiries, feel free to let me know via the comments section, the Battle Brush Studios Facebook page or via e-mail. Don't forget that any WW2-themed painting/modelling project commissioned during all of December is -20%! - Extended until January 17th!! Thanks for the review - I have to agree with you on Warlord being a little "odd" with including decals and instructions for someone aiming to be a major player in the vehicle models market. They did include decals with the "Panzergrenadiers" Hanomags, 3 sets of identical decals right down to the same licence plate number! how hard would it have been to provide some variations? Thanks for the comment, Stuart! Yeah, with Warlord Games I would have expected a decal sheet. However, with most other companies I would be totally cool with no decals at all so I'm not sure if this is a matter of Warlord Games having done something wrong or me going into it with weird expectations. Maybe it's a half way thing. They do include decal sheets with all their plastic vehicle sets (review of the Hanomag set will be up on the 15th ;-) ) so there's at least something good. The license plates are kind of a problem, I agree. They either would have to add additional number plates on the sheet or you freehand some different numbers on there.